Because I like to know why things changed suddenly and also because I am still trying to determine which foods (besides bread) are processed slower than others by my metabolism , I had a closer look at my food diary and fitbit stats of the past week and I noticed several things. 1. 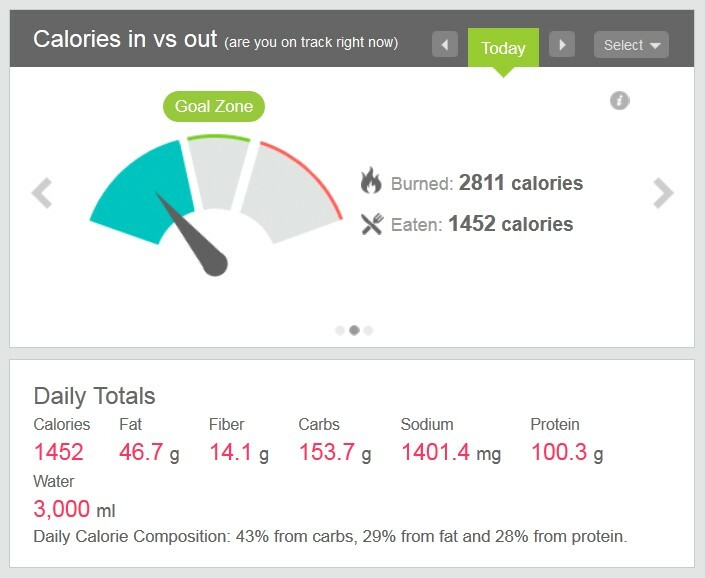 Since last Thursday, my daily calorie intake has been hovering around 1.500 kcal, sometimes, just over but usually just under. This is only about 100/150 kcal lower than my average during the plateau period i.e 2 apples worth. Such a small difference, isn't it? 2. For the past 7 days, my carb/fat/protein ratio has been more balanced. I have to honestly say, that I never paid much attention to the ratios. My main focus has always been to make healthy choices and to keep the kcal in check, in order to achieve a deficit of at least 750 kcal a day. 3. My dinner, which up to now was always about 40% of my daily energy intake has dropped to 34%, closer to the recommended 30% for weight loss. 4. My amount of daily steps have gone from around 5.000 steps to around 6.500. I don't know if these findings are just a lucky coincidence or are truly the key to speed up my weight loss. There is only one way to find out and that is to persevere in that direction. It will be hard to keep up this winning streak next week though, as being abroad on holiday, we will be eating out every single day. But I'll do my best.